Is this a Her Space Holiday album, or have you changed your persona to XOXO, Panda? It's confusing. 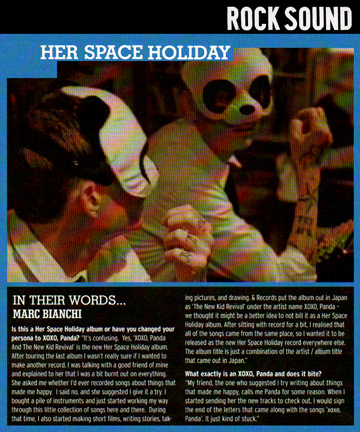 Yes, XOXO, Panda And The New Kid Revival is the new Her Space Holiday album. After touring the last album I wasn't really sure if I wanted to make another record. I was talking with a good friend of mine and explained to her that I was a bit burnt out on everything.. She asked me whether I'd ever recorded songs about things that make me happy. I said no, and she suggested that I give it a try. I bought a pile of instruments and just started working my way through this little collection of songs here and there. During that time, I also started making short films, writing stories, taking pictures, and drawing. &	Records	put	the album out in Japan as The New Kid Revival under the artist name XOXO, Panda - we thought it might be a better idea not to bill it as a Her Space Holiday album. After sitting with the record for a bit, I realised that all the songs came from the same place, so I wanted it to be released as the new Her Space Holiday record everywhere else. The album title is just a combination of the artist/album title that came out in Japan. What exactly is an XOXO, Panda and does it bite? My friend, the one who suggested I try writing about things that made me happy, calls me Panda for some reason. When I started sending her the new tracks to check out, I would sign the end of the letters that came along with the songs "XOXO, Panda." It just kind of stuck.